Over two weeks ago I was packing my floral case and checking, then re-checking we had our passports ready for a lovely trip to Paris. It was part of my birthday week and I may or may not have persuaded Sebastian that it would be the perfect trip for us. My passport runs out in the second week of May so I felt I needed to visit Paris before renewing it next year with my brand new surname! So after many delays and such, we finally arrived late Thursday evening to our lovely little garden studio apartment in the heart of Neuilly Sur Seine. We found this darling little sanctuary on airbnb.co.uk which I highly recommend for a cheaper and a little quirkier stay when adventuring. I haven't been to Paris, properly, since third year at university back in 2009 where we all went on a trip to Paris Fashion Week. So this trip was Sebastian's first Parisian adventure so naturally we had to visit all the monuments and wonderful museums. The first day we walked to the Arc De Triomphe and down the Champs-Elysées browsing in all the beautiful shops and wishing for all the money in the world. We then strolled up to place de la Concorde and over to the Musee du Louvre. We decided not to go into the Louvre, I have been before and wouldn't have minded going in again to be honest but Sebastian wasn't too fussed and so we decided to sit and stare at the beautiful architecture and pyramids. 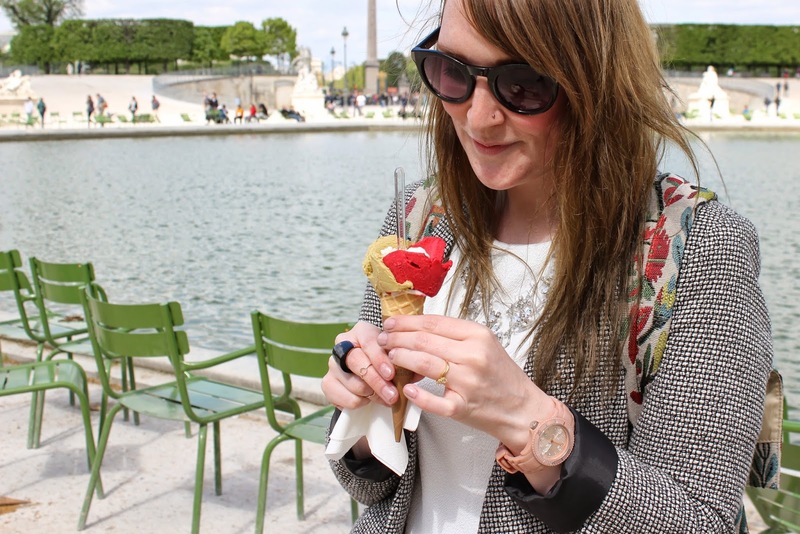 But first we sat around the fountains in the Jardin des Tuileries and I just HAD to purchase myself an ice cream from the Amorino stand. At 3' 95 Euro, for a small cone, I think it's a pretty good deal. Let's face it, I'd probably pay 10 Euro for a floral shaped ice cream! Especially if one of the flavours is coconut! So after taking several snaps of the pretty museums' outer building, we then walked around the corner to visit the Ponts des Arts... or the Love Lock Bridge as it is often referred to as, before heading to Musee d'Orsay. Lovely miss Jenny had thoughtfully put a padlock in my birthday box especially for the trip, so we doodled our names on with a sharpie before visiting this colourful bridge filled with romantic memories. There are padlocks of all sizes and shapes attached to gates of the bridge and it is such a nice sight. I was worried that it may have been forbidden as I was aware of some petition that had been going on back in March, but luckily for us it wasn't. Sebastian took some great shots of us on the bridge so I shall have to get them from him and share them with you, they are funny. I do love this idea. I just stood in one place and just read all those romantic messages, intials engraved, written padlocks. It is pretty spectacular. If you're an old romantic like me, I highly recommend you taking a stroll on the Love Lock bridge with your love or best friend. Attach a padlock and throw a key in the Seine... or not. It's just a wonderful setting. After a browse at the glorious paintings in Musee d'Orsay we took a turning to Musee Rodin... because well even the gardens are just beautiful. We spent a nice amount of time just sitting in the garden overlooking the statues and enjoying the views. I spent an unhealthy amount of time just staring at the beautiful golden rooftop of Les Invalides. Look how beautiful it is! We finished the day by walking to Champs de Mars and sitting on a bench with the most special view of the Eiffel Tower. It was pretty perfect. We hopped on the metro back to our garden studio with a bag full of chocolat, cherry beer and snacks. I can't tell you how much I've been looking forward to this post - and your little snapshots of Paris have certainly brightened up my revision break! Paris in the spring looks absolutely beautiful. When we visited in the summer a couple of years ago there was a huge heatwave and so I don't think I was able to enjoy it as much as I would now. Sounds like you had a great time! These photos are lovely! I'm glad you enjoyed your trip. Paris really is always a good idea. Looking at these photos just reminds me of how much I have loved every visit to Paris. I've seen the padlocks but never added my own - maybe Mr CC and I will have to next time we visit! I love Paris but haven't been in years, thank you for sharing your pictures!